An intractable tea-swilling leftist-punk bard, Rhyd Wildermuth has left bits of his heart(h) everywhere—in a satyr’s den in Berlin, hanging from an elder tree over a holy well in Bretagne, scattered in back alleys of Seattle, and lost somewhere in the bottom of his rucksack. He’s devoted to Welsh gods, breathes words, makes candles, plays recorder, fumbles with tech, and refuses ever to learn to drive. 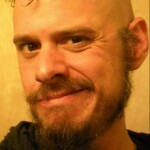 He also writes for The Wild Hunt, Patheos Pagan, and on his blog Paganarch.com. As both a fiercely leftist Anarchist and as a Polytheist, I’ve found myself often in an odd predicament. Anti-Capitalist and Anti-Statist theory is generally materialist, assessing belief in gods and spirits as forms of social control which sustain authoritarian and exploitative forms of governance and economics. In such estimation, then, Pagan and Polytheistic reconstruction appears to be reactionary, an attempt to return to false idyllic times and earlier modes of oppression. While much of my writing elsewhere has taken up the task of showing Pagans that Marxist and Anarchist analysis of Capitalism can help liberate space for the gods, few words have been directed to the opposite task: proving the radical potential of Polytheistic religions to non-religious radicals. Part of the difficulty has been the insular nature of Polytheistic writing: most theological and philosophical debates have centered on issues of Praxis or the nature of the gods Themselves. But another issue looms larger, one that it seems time to take up. The various Polytheisms, unfortunately, have under-developed understandings of race, the State, and the Modern itself, understandings which leave them them frightfully open to co-option by reactionary, “New Right” theorists. In response to such incursions, supporters of Liberal-Capitalism can rightly point to racist tendencies within Paganism, but they are not the only accurate critics: Leftist theorists, too, have continuously pointed to Pagan-Polytheist acceptances of racial theories and have suggested that such tendencies are inherent to Polytheism, particularly in aspects of cultural and ethnic re-construction. From a perspective outside Polytheism, such adoptions and cultural reconstructions hew dangerously close to similar projects by racial-Nationalists. Political and philosophical theorists have commented repeatedly on such reconstructions as a [false] “search or authenticity” or an embrace of the anti-Modern. Neither of these claims should be dismissed outright, however, for the embrace of older forms of relationality does present us with an important question: is there something deficient within Modern society against we should react? That is, is the embrace of older cultural and ethnic modes a form of protest. I’ve elsewhere described the displacement of peoples and the destructions of older social forms through the process of Capitalist transformation, so a quick summation of the matter should suffice. The most significant upheavals which caused migration and loss of tribal and ancestral lands have occurred in the last five hundred years through economic activities. The trade in African slaves to the Americas is estimated to have displaced approximately 12 million people from ancestral lands across an ocean; 10 million Irish are said to have left their ancestral homes since 1700, mostly to escape poverty; and while more American citizens claim German ancestry than any other ancestry, the descendants of the First Nations of the Americas now number only 5 million (or 1/60th of the population). Massive displacements previous to the beginning of imperial colonization occurred mostly due to famine or war: after the 1700’s, particularly, slavery, industrialization and the privatization of lands became active presences which have brought us to our current, vastly intermixed modern societies. A Celtic Reconstructionist (of which the most active and publicly-populated groups appear to be Irish Reconstructionists) in America faces certain questions of authenticity and certain difficulties not present in one still living in the same land as the culture they are attempting to reconstruct. Irish is not a common spoken language in the United States, nor is America littered with the graves or holy sites of ancient Irish peoples. Likewise, the Heathen attempting to embrace ancient Northern European social forms is faced with similar difficulties—archeological troves of Heathen artifacts cannot be easily visited without the use of a boat or airplane. I worship primarily Welsh gods and goddesses, and it should be self-evident that Welsh social forms are not easily reconstructed from threads within American society. For the Hellenic or Kemetic to visit ancient temples, they must rely on shoddy reconstructions in theme parks or take a transatlantic flight. This is the same difficulty faced by other cultural and ethnic groups, and this point cannot be overstated. For the indigenous American (First Nations), systematic governmental policies, forced displacement, and Christian missionaries significantly eroded and erased continuous connections. Likewise for the descendent of African slaves—what little survives of ancient African traditions in America has quite often been syncretized into Christian forms and is not always easy to reconstruct. These gaps are not insurmountable, of course. While reconstructionists of European traditions can rely upon textual survivals and those of the African Diasporic Religions have more significant bodies of oral traditions (and oftentimes continuously-practiced iterations of Animist spiritualities in Africa), and many traditions accept some degree of personal revelation (often dubbed “Unverified Personal Gnosis”) which often succeeds in later becoming verified through practice or eventual discovery. But in all cases, though, one must again ask why “reconstruction” is important at all That is, since most polytheisms accept as an unstated axiom that ancient gods persist into the present, why place any sort of importance upon the older forms of worship and belief when those same gods reveal themselves in the present? Many Atheist and Liberal-Humanist critics have suggested that the search for authentic historical identities are in some way a regression to pre-modern times or a rejection of the Enlightenment. These criticisms are often based not only upon the belief that the state of modern Democratic, Liberal-Capitalist society is a preferable situation to all previous forms, but that modern notions of Freedom and Human Rights require the social and cultural forms which have been engendered by modernity. In this conception, ancestor worship, tribalism, worship of and sacrifice to gods, and non-Capitalist economic forms (trade, gifting, barter) were either symptoms of societal relations which led to misogyny, authoritarianism, slavery, and violence, or they were to some degree the cause. Sam Harris and Stephen Pinker, both popular Atheist writers, have significantly contributed to this conception, but they did not themselves originate these ideas, which have their roots in writers of what we have called “The Enlightenment.” Voltaire, Hobbes, and even anti-Capitalist writers such as Marx and Proudhon were foundational in the notion that human freedom required the abandonment of “primitive” or pre-Enlightenment social relations. With the exception of Post-Colonial writers, most theorists on the Left have perpetuated this notion, though in a different form. Slavoj Zizek and Jean Baudrillard have both criticized attempts to reconstruct ancient cultural practices as a symptom of societal alienation, ineffective protest, and commodified lifestylism. While there’s much to argue against in their estimations of Polytheistic reconstructionism, their analyses hit closer to a more accurate understanding of the desire to revive ancient cultural forms. While I’ve never truthfully been labeled a “centrist,” a dialectal synthesis of these two criticisms is precisely what I’d argue we should embrace. The Liberal-Humanists are certainly correct: many of our modern, “progressive” ideals require the destruction or transformation of older social forms. The Capitalist market and the modern Nation-State supplant, subvert, and ultimate diminish local-based economies, regional autonomy, and community-derived value systems (an occasional critique from European conservatives, evident in the writing of political critic John Gray and Catholic theorist G.K. Chesterton). Likewise, modern Leftist theorists, though perhaps heavy-handed in their conflation of proto-fascist and fundamentalist movements with reconstruction, are nevertheless correct in their estimation of reconstruction as a response to alienation and a form of protest against the universalization of experience inherent in modern Capitalism. It is this where we must tread carefully. There exists a significant trend within both Heathenism and Celtic Reconstructionism (as well, to some degree, within Hellenic Reconstruction) unquestionably to adopt modern notions of identity and transpose them into the reconstructed past, a process historians and philosophers call “re-inscription.” Re-inscribing modern political and social ideas into the past is quite often critiqued, particularly within CR, but less susceptible to rigor are nearly-invisible notions of race, genetic ancestry, and cultural exclusion. It is incredibly common to hear unchallenged (and vigorously defended) negative statements regarding “non-Celtic lineated” peoples speaking about “Celtic” gods, as if the gods in question were subject to modern conceptions of race and lineage. Worse, some even pervert anti-Imperialist and Post-Colonialist theory into a defense of racial deities, linking criticisms of cultural appropriation of subaltern peoples to CR insistence that worship of Celtic gods is either more authentic or appropriate by Celtic-lineated peoples. The difficulty lies precisely in the re-inscription. Race-theory is a very new (that is, Modern) idea, birthed during the very Enlightenment which anti-racist Liberals praise. Iterations of such classifications of peoples have always existed in multiple cultures, but, as Hannah Arendt argues in The Burden of Our Times, these ideas don’t become ideologies until found useful by State and political actors. That is, the division of peoples into racial classifications did not become a “thing” until it proved to be a practical ad hoc justification for European imperial ambitions. An intriguing aspect of this is the notion of “whiteness;” those of European descent did not see themselves as “white,” but rather as part of specific cultural and ethnic groups (Slavs, Welsh, etc.). National identities did not exist until the creation of the modern nation-state: there was no “German” people until there was a Germany, nor American until there was a United States of America. The implications of this to polytheistic-aligned cultural movements should be clear. Re-creating or reconstructing an Irish or German cultural framework based on modern notions of what is an Irish-people or German-people become re-inscriptions, a re-writing of the past in order to seek an authentic tradition. That is, many of these attempts, while certainly fulfilling and honorable, do not go far enough in their challenge of Modern notions and their reconstruction of older ideas. At this point, one must re-examine the notion of reconstruction as a critique or protest of Modernity, which will also be the subject of future columns. I’ve written elsewhere regarding the problems of the Liberal Capitalist Hegemonic order, but I’ll restate more succinctly: Capitalism flattens experience of its subjects and participants in order to perpetuate reliance upon the market. European peoples were displaced from their lands (and ancestral customs) in order to force them into a consumer/producer state, just as the process in Africa, South America, and Asia continues to do. Without access to authentic (that is, self- and community-created cultural forms), subjects of Capitalist orders became reliant on the market (and later, media) for cultural fulfillment. That search for authenticity within modern reconstruction movements is linked to the one-sided (that is, consumer) aspect of cultural creation within Hegemonic Capitalism, for the alienation from the means of cultural production is not just a theoretical mode—it’s a tangibly-felt Presence, the power of which even Materialist-Atheists such as Marx and Weber acknowledged. Therefore, we should embrace the search for authenticity and attempts to reconstruct older social and cultural forms as a liberationist project, but we must do so whole-heartedly. Every aspect of Modernity must be critiqued and acknowledged, particularly problematic (and violent) notions of Race and The State. We endanger the revolutionary and liberatory potential of Polytheism if we allow unquestioned modern doctrines to inform our attempts to create another way of life, one which is unapologetically new-old and old-new and fiercely anti-Modern.